The U.N. climate conference in Paris is the most anticipated meeting of the parties to the U.N. Framework Convention on Climate Change (UNFCCC) since the convention’s inception over 20 years ago. Following on agreements at past summits, the Paris meeting is supposed to generate the comprehensive long-term global agreement for addressing climate change. The good news is that the negotiators are not starting from scratch. In meetings over the past year, the parties to the UNFCCC have already worked out a 54-page official draft of the Paris deal. Those pre-meetings are often less actual negotiations between countries about text of the agreement than lobbying by countries or groups of countries for inclusion of text in the agreement. The optional passages and square bracketed text in the draft therefore provides a good guide to the most contentious issues. 1. What form will the agreement take? A central question is whether whatever deal emerges from Paris will have teeth. The desired words most often used in the media and by activists is a “legally binding” treaty. Such wording is contentious but also very vague. “Legally binding” can mean a lot of different things and, as this terrific dissection of the legalese posted at Carbon Brief concludes, may be largely irrelevant given how easy such rules can be to evade. In the end, some aspects of the deal like the reporting structure may be what people consider “legally binding.” But don’t expect legally enforceable penalties for non-compliance with greenhouse gas targets – no major emitting countries are open to that, nor would they agree to pay even if a deal were in place. In advance of Paris, each country has submitted an action plan known as an Intended Nationally Determined Contribution (INDC). The system is a huge improvement on the past vacuous system of naming emissions targets without any explanation as to how it may be met. A follow-on question is how progress will be measured and policed. One success at Paris may be mandating a standardized national system for reporting progress towards emissions targets. A minor victory would be simply forcing country submissions to (finally!) all use the same baseline year. The likelihood of staying below an even more stringent temperature threshold aside….this issue is not going to disappear. Countries like Kiribati, Tuvalu, and the Maldives see this as a matter of life and death, not to mention a matter of respect. (There’s a PhD thesis out there for someone who wants to tackle the geopolitics of the ongoing argument over temperature thresholds). The contention over finance is not to be underestimated. There may be as much or more discord over financing, especially for climate change mitigation and adaptation in the developing world, than over emissions targets. What will count as finance? Depending on what counts, the world may be up to 70% of the way to the goal. How will the UNFCCC ensure that finance is “new” and “additional” to existing development aid? What fraction of funds will be funneled through the new U.N. Green Climate Fund, which disbursed its first grants this fall? What fraction of contributions may be private investment? Are middle-income countries like China expected to be “donors” in this system? This is another seemingly intractable issue. At the 2013 meeting in Warsaw, the parties agreed to set up a legal mechanism for providing compensation for “loss and damage” due to climate change. No one really knows how this will work. The obstacles are many, from the reluctance of developing countries to assume legal responsibility for any damages, to the chances of developing countries agreeing to more financial transfers when existing aid goals have yet to be met, to the basic scientific challenge of calculating the fraction of damage (e.g., from a storm surge) that can be attributed to climate change, let alone to specific parties to the convention. Underlying the first five issues is the core ethical question of how to appropriately address the inequality of climate change. Some countries are historically more responsible for the greenhouse gas emissions, better equipped to adapt to climate change, and better able to reduce emissions without hurting economic growth or overall well-being. Language surrounding “common but differentiated responsibilities” and “respective capabilities” is contentious at every UNFCCC meeting; the phrases each appear 12 times in the draft text, always in square brackets or as options. While the targets and mitigation plans may be more important than the language recognizing the basic inequalities of climate change, the decisions around such language could symbolize how committed the developed country parties are to their mitigation targets and the agreement as a whole. 7. How will the agreement enter into force? International agreements do not officially come into effect the day the meeting ends. There are usually provisions which mandate that the agreement comes into effect only after it is ratified by some fraction of the governments of the countries involved. A game of legislative chicken ensues. Delays can be deadly. The Kyoto Protocol is case in point. The parties agreed it would not come into effect until ratified by countries representing >55% of the industrialized world’s greenhouse gas emissions. That took eight years. By the time Kyoto came into force in 2005, Canada’s emissions had ballooned to 30% above the agreed-upon target. How this problem will overlap with the Obama Administration’s push to avoid ratification by Congress is unclear. One thing is certain: the choice of X in the above paragraph could end up being as important as anything else that happens in Paris! The Trudeau government comes into power after years of, in the assessment of climate policy expert Marc Jaccard, the federal government doing “virtually nothing” to meet its greenhouse gas targets. With a little over a month before the UN Climate Summit in Paris, the government must act fast to demonstrate to the world that Canada will be an active part of the global effort to address climate change. It also needs to show Canadians what the experts all know – that addressing climate change is not a choice between the environment and the economy, it is a choice between the future and the past. Here are four steps the government could take in advance of Paris to win back trust on climate change in Canada and abroad. First, the new government must be honest with the public about what is possible. As much as it pains me to write this, that means holding firm against calls for more aggressive emissions targets. Environmental activists are upset that the target set by the former conservative government – a 30% reduction below 2005 levels by 2030 – is not in line with the global goal of minimizing global warming to less than 2°C. They are correct. However, the fact is we are far off the pace to meet even this “weak” target. Experts on the emissions will roll their eyes if Canada promises a more ambitious target. After years and years of empty promises, it is better to strive to meet an underwhelming goal then yet again fail completely to meet an overwhelming goal. Second, announce an action plan for holding provincial meetings to negotiate carbon pricing either in advance of, or ideally at, the Paris climate summit. During the campaign, the Liberals smartly recognized that, like it or not, the federal government cannot shove a carbon price down the province’s throats. The ideal compromise is an opt-in plan, whereby each province agrees to either use a federal carbon price, established via a British Columbia-style tax or a cap-and-trade system, or employ its own system with at least an equivalent price. Third, signal intent to reinvigorate an environmental assessment process compromised by the Harper government. That includes eliminating changes that were made to environmental legislation like the Navigable Waters Act, and also requiring that greenhouse gas emissions must be considered in all National Energy Board decisions. The combination of carbon pricing and a return to Canada’s once- rigorous environmental assessment will take the decisions about carbon-intensive infrastructure out of the hands of lobbyists. Rather than the Prime Minister promising a yes or a no to individual pipelines, the Prime Minister should make sure Canada has an assessment system equipped to make the right decision for the climate, the environment and the economy. Finally, bring Canada’s federal scientists back out of the dark. The world has watched as the Harper government undermined Canada’s long-standing reputation as a scientific leader. Labs were closed, libraries were destroyed, funding for pure research was cut, and government scientists were blocked from speaking to the media. While the damage to Canada’s research capacity and environmental monitoring cannot be undone in the few days before our federal delegation embarks for Paris, a symbolic step can be taken right away. What better way to show Canadians that the government trusts data and is serious about addressing climate change than to include one or some federal government climate scientists as official parts of the government delegation to Paris. These are only the first of many important steps for Canada. There’s much to be done on research and innovation, green infrastructure, and climate aid to the developing world, which one could argue belong here as well. The good news, as this election has demonstrated, is that a change in direction is possible. The Canadian emissions quandary: Has this ship sailed? Climate scientists often say stopping climate change is like stopping a supertanker. The ship has a lot of momentum, so you can’t just slam on the brakes at the last minute. The analogy is referring to the physics of the climate system itself, but also holds true for the sources of greenhouse gas emissions. The technology exists to dramatically reduce greenhouse gas emissions but we can’t implement it all today over lunch. In Canada, the emissions supertanker has been charging along despite repeated warnings of the iceberg ahead. After years without serious coordinated federal action, a promise to meet an ambitious emissions target, no matter how well-intentioned, no matter how grounded in scientific analysis, now looks unrealistic. 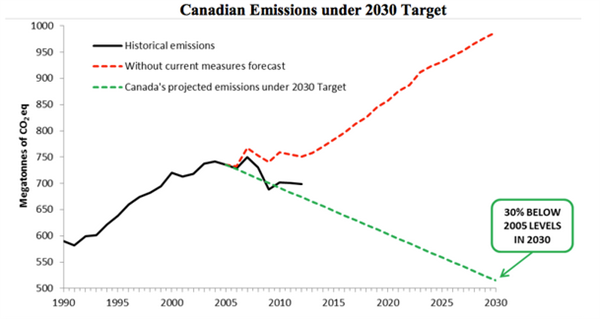 Here are the emissions since 1990 together with the Environment Canada projection to 2030, the various proposed emissions targets, and some coarse reduction scenarios. Most analysts argue that the current government’s policies and plans are not close to sufficient to reach the existing target (17% below 2005 levels by 2020) or the new target (30% below 2005 levels by 2030). 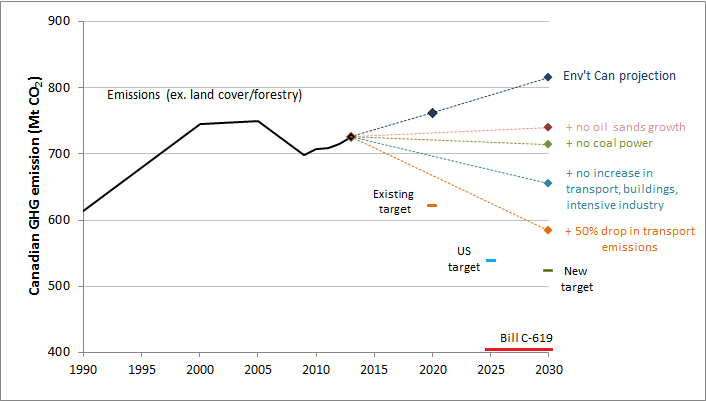 The emissions target from the “Climate Change Accountability Act” Bill C-619 (34% below 1990 levels by 2025, now 2025-2030), which the NDP pledges to reintroduce if elected, is even more unrealistic. Again, this is not about the scientific value of the target – Bill C619 would put Canada in line with the global goal of reducing emissions sufficiently by 2050 to avoid a high probability of 2 degrees C warming. It’s clear from the emissions inventory that to reach even the less ambitious current targets, Canada would need to reign in emissions from the oil and gas sector and ramp up efficiency in transportation, buildings and other intensive industries (not to mention forestry – not included in this analysis). Many of the necessary innovations are possible, and some may be encouraged by resource prices and other global factors. It will still be difficult to meet the new 2030 target, let alone the ambitious and likely politically impossible Bill C-619 target. After twenty years of political rhetoric, the plans are more important than the targets. Canada may not meet the proposed targets but it can at least make some progress and show a serious commitment to addressing climate change. Has climate change played a role in the Syrian conflict? This is re-posted from exactly two years ago. Since then, the Syrian refugee crisis has worsened. The Syrian conflict has become a humanitarian tragedy incomparable to others in recent history. Over 2 million people, 10% of the country, have fled during the ongoing conflict according to the UN. While the proximate drivers of the Syrian conflict are a reaction to an oppressive government, the wave of Arab Spring protests, and other political, social and economic factors, a number of experts have argued that climate change, or at least climate, has served as a “multiplier”. 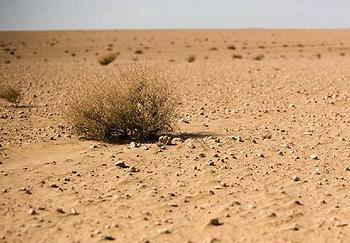 Links between climate change and the Arab Spring have been suggested for the past couple of years. High wheat prices in 2010-11, driven by droughts in Russia and China, may have contributed to the unrest in Egypt and the overall timing of the Arab Spring protests. In Syria, add on the fact that a severe drought over the past decade has devastated farmers. Since the 2007/2008 agriculture season, nearly 75 percent of these households suffered total crop failure. Depleted vegetation in pastures and the exhaustion of feed reserves have forced many herders to sell their livestock at between 60 and 70 percent below cost. Syria’s drought break point was the season 07/08 which extended for two more seasons, affecting farming regions in the Middle north, Southwestern and Northeastern of the country, especially the northeastern governorate of Al Hassakeh. The drought is causing a high drop-out rate, families left in the area who cannot afford, or do not want, to move are suffering. Some figures estimated the people lifted their villages to be more than one million people. Thousands of Syrian farming families have been forced to move to cities in search of alternative work after two years of drought and failed crops followed a number of unproductive years. The field survey that conducted by ACSAD/MoLA/UNDP in January 2011 showed that most of the houses on villages are left empty and less than 10% are occupied by old people and children, The younger generations left for thousands of kilometers seeking work. The amplitude of the externally forced [ED-meaning “human-caused”], area-averaged Mediterranean drying signal (estimated from the ensemble mean of CMIP3 simulations) is roughly one-half the magnitude of the observed drying, indicating that other processes likely also contributed to the observed drying. Naturally, these connections need to be viewed with caution. Climate change is not solely responsible for the Syrian drought, as natural climate variability and ill-conceived land use and agricultural policy clearly also contributed. And the drought itself is only one of many stressors that led to the crisis in Syria. The fact is we will never be able to precisely calculate the contribution of climate change to a geopolitical event or a humanitarian crisis. Does the inability to provide a precise answer – the drought is 44% due to climate change – matter? Inability to attribute events to climate change may make adaptation seem impossible. A solution is to not view adaptation as separate from other development activities. For example, the large aid institutions recommend marrying climate change adaptation and disaster risk reduction. In other words, when working on a program or system to reduce future droughts, consider how climate change may alter the likelihood and nature of future disasters. Right now, any of that would be a luxury in Syria. Dealing with the everyday humanitarian crisis is paramount. Hopefully, in time the crisis will abate enough to work on rebuilding people’s lives and improving the capacity to deal with future droughts. The Canadian government committed to reducing GHG emissions by 30% below 2005 levels by the year 2030. It was immediately derided by some observers as weak and others as ambitious. It is both: weak in terms of international equity, but ambitious given existing Canadian emissions policy, or lack thereof. But there’s an even more fundamental problem. Just what is the actual target? Canada intends to account for the land sector using a net-net approach, and to use a “production approach” to account for harvested wood products. Canada will exclude emissions from natural disturbances. But that’s only the first problem with the data in the Canadian submission. 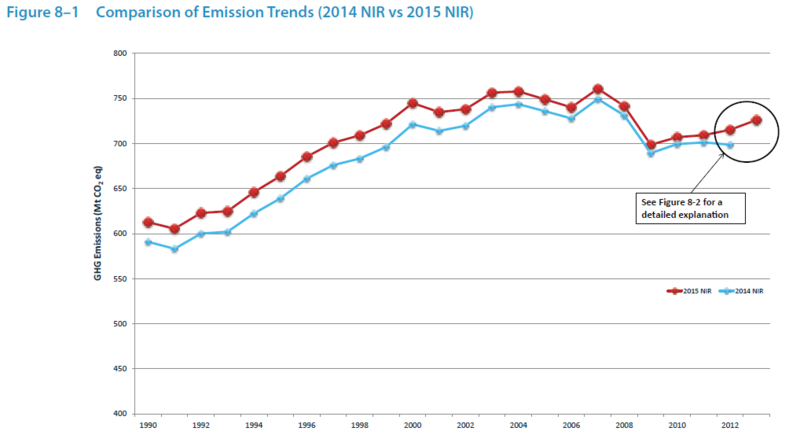 The graph uses historical data from the national emissions inventory completed in 2014, which includes data from 1990 through 2012 (data available from the UN). The latest Canadian inventory report, however, was published in April. Every time one of these reports is compiled, the historical emissions are recalculated based on changes in national and international methods. Let’s be clear — the recalculation is not subterfuge. Revisiting past calculations is standard practice and takes legitimate effort. The problem is Canada’s own INDC did not use Canada’s own most recent data. 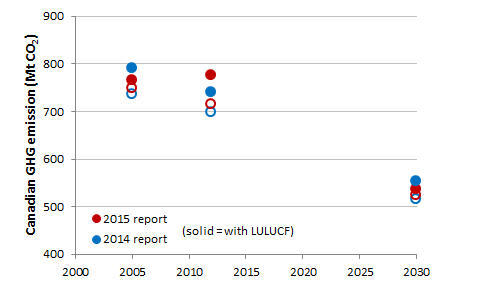 Given the recalculation and the confusion about whether LULUCF is included, the 2030 target is a bit fuzzy. Here’s a comparison of the possible interpretations of 30% below 2005 levels by 2030. The target could be from 515 to 552 Mt. Semantics? No, the difference is more than half the current emissions from the oil sands. The government itself seems to be confused. Just today, the Environment Minister’s communication person stated the target based on the latest data (749 Mt – 225 Mt = 524 Mt) but excluded LULUCF, which seems incorrect. There seems to be a basic gap in quality and effort between the very professionally done National Inventory Reports and the seemingly haphazard INDC prepared for the United Nations. Given how challenging it will be for Canada to meet its target, and how little credibility Canada has right now on climate policy, the federal government needs to straighten all this out.